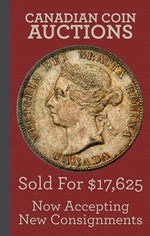 Description: This is the most “common” high denomination issued by The Dominion of Canada. It is currently thought that around ten 1925 $500 bills are known to exist. Odds are a few others will be found as the years pass. King George V is on the front of each bank note. We would certainly welcome the chance to purchase one of these bank notes in any condition. Varieties: It is not uncommon for an issue this small to have no varieties; and that is the case with 1925 $500 bills. Signors and serial numbers can be different. The main design elements will always be the same though. 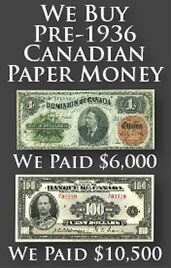 We buy all 1925 $500 bank notes from The Dominion of Canada. Values are based purely on condition and generally start at about $30,000. If you would like our offer, then please send us pictures of your bank note. We will grade the paper money and respond back quickly with our buy and sell price. You might be surprised at how much money some high grade notes can be worth.